Your loved one, while receiving the highest quality of care, might need a level of companionship that you want to give, but simply can’t provide at this time. Especially for those that live alone, companionship services, whether through a home health aide or qualified volunteer, can prove critical to helping improve the patient’s outlook on their life and illness. Amber Wiesner, Executive Director of VNA of Ohio's private-duty home care service, Home Assist™, shares that simply having a companion for patients at mealtime can yield great benefits. 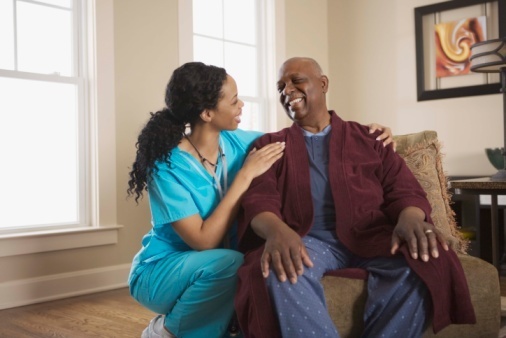 The following are other clear benefits to using companion services through your home healthcare provider. Decreased anxiety and depression: In short, having a friend to talk with, share stories, or simply spend an hour or two together, will keep the patient engaged and social during difficult times. Stay stimulated: A companion can provide a break in an otherwise uneventful day, especially those with limited mobility, or if you or a family member is occupied with outside obligations. Experience the world outside: With the proper clearance, companions can accompany patients to places like the mall, movies, stores and other events. This keeps them connected to the world outside and enables them to experiences things they may have enjoyed before their illness. The strength of your home healthcare team isn’t just limited to those administering to the patient’s medical needs. You can help secure the emotional health and well being of the patient through exploring options for supplemental companionship. Learn more about Home Assist™, the Visiting Nurse Association of Ohio's companionship and personal care service, or call us today at 1-877-698-6264.